I was unable to find a birth entry for Charles, Margaret or Matilda. Charles’s death entry showed he was 85 years old in 1925, indicating a birth year of 1840. It seems likely that he was born before the family arrived in Australia. I then went looking for the death entries for Margaret and Matilda. Matilda Stewart Barnes died in 1921, age 67, at Footscray (reg. no. 9895). Her parents were listed as Farquharson Gordon Chas and Maud Unknown. Her age at death indicated she was born in 1854. Since I wasn’t able to find a birth entry for her, it seems her birth wasn’t registered. I found a Public Member Tree at Ancestry which showed the following children for Charles Farquarson Gordon and Maude Matilda Stewart. These details matched the records I had found, except I had Donald, John and Andrew all with their birth registered in 1850, I had found no record of a George Gordon, and I had a death year of 1859 for John, rather than 1849. I obtained the baptism certificate for Donald, John and Andrew which showed that Donald was born 2 January 1843, John was born 17 March 1845, and Andrew was born 12 July 1850. The three boys were baptized 4 August 1850 at the Presbyterian Church in Melbourne. In looking at the record for Donald Gordon in the Public Member tree it showed he had been born at sea, on board the “Gannet”. I checked the Assisted Shipping Index at the Public Record Office Victoria website, and was unable to find a record for the family, which indicated they were unassisted passengers. I then decided to search on Trove for a record for the “Gannet”, and found the following notice. 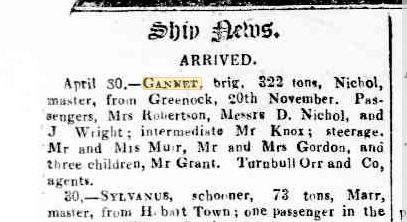 This article showed that a Mr and Mrs Gordon, with three children, had arrived in Port Phillip on 30 April 1843, and that the ship had left Greenock on 20th November 1842. This tallied with the information already found for the family. The three children would have been Margaret, Charles, and the newborn, Donald. The next thing was to find the death entries for Donald and Andrew, and to find marriage entries for each of these children. In looking through the death entries for all the Donald Gordons, I noticed an entry for Donald Robert Gordon who died in 1941 at West Melbourne, aged 64 years (reg. no. 10256). His parents were Donald Robert Nicol Gordon and Mariah Davidson. I now had the name of Donald Robert Nicol Gordon’s wife. Donald Gordon and Maria Davidson were married in 1873 (reg. no.1865). Andrew Gordon died in 1903 at Balwyn, aged 53 years (reg. no. 8459). His parents were Chas Gordon and Maud Matda Stewart. There was only one marriage entry for an Andrew Gordon: Andrew Gordon married Bridget Darmody in 1873 (reg, no 1640). Margaret Nicholl Gordon married Matthew Duncan in 1861 (reg. no. 207). Matilda Stuart Gordon married Anthony Barns in 1874 (reg. no. 4471). Margaret Nicol Brewer, wife of Alexander Brewer (of Sand Hills Launceston). I found a marriage entry on the LincTasmania site for Alexander Brewer and Margaret Duncan. Her parents were Matthew Duncan and Margaret Nichol Duncan. Annie Isabella Baker, wife of Lewis Baker. I found a death entry for Annie Isabella Baker – her parents were Matthew Duncan and Margaret Nicol Gordon. Since the individuals in his will were nieces and nephews, it appeared he didn’t have any children – or at least none that survived him. I don’t know if he ever married. Margaret Nicol (Nichol/Nicholl) Gordon was born about 1838. She married Matthew Duncan in 1861, and died in 1903 at East Melbourne. Charles Gordon was born about 1840. He died in 1925 at Cheltenham. It is not known if he married. Donald Robert Nichol Guernet Gordon born 2 Jan 1843 at sea on the “Gannet”. He married Maria(h) Davidson in 1873. He died in 1911 at Footscray. John Gordon born 17 March 1845. He died in 1859. Andrew Gordon born 12 July 1850. He married Bridget Darmody in 1873. He died in 1903 at Balwyn. Matilda Stewart Gordon born about 1854. She married Anthony Barns in 1874. She died in 1903 at East Melbourne.